Australian Kenneth J. Warren (1929-73) was an unmistakable character, bald, burly and very often enjoyably hovering on the brink of overdoing it. He first came to attention in the stage play Summer of the Seventeenth Doll (later filmed, but not with him), and after performing it in Britain, in 1958, decided to stay. 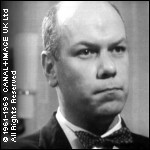 His film career began with I Was Monty's Double (1958, with Steven Berkoff), but is more typified by his appearances in crime dramas, including Joseph Losey's The Criminal (1960), and The Informers (1963), a film absolutely dripping with Avengers faces, including Harry Landis and John Cowley, both fellow "Little Wonders" cast members. Warren had typically forceful roles in I, Monster (1970) and The Creeping Flesh (1972), both period horrors starring Peter Cushing and Christopher Lee. Strangely, neither was made for Hammer; Demons of the Mind (1971), which Warren made between the two, was, but was an uncharacteristic and non-starry attempt by the studio at a more psychological form of horror. One of Warren's last film roles was as a destructive military bigwig in Digby, the Biggest Dog in the World (1973), a very silly but quite enjoyable caper that seemed to be on TV every Christmas when I was a kid; I've a nasty feeling there'll be a Hollywood remake one day. On TV, Warren's splendidly unrestrained villain in The Saint: The Fiction Makers (ATV/ITC, 1967) was definitely cut from the same cloth as his Z.Z. Von Schnerk; this two-part story was actually shown in cinemas in some counties (like Vendetta for the Saint (1969), with Ian Hendry). In Danger Man/Secret Agent, "The Paper Chase" (ATV/ITC, 1966), also directed by Patrick McGoohan, he wore a wig for most of his scenes and, in a typically eccentric McGoohan touch, was first seen surrounded by bald men (one of whom was Peter Swanwick, soon to join McGoohan on The Prisoner). He was the monstrous press baron Lord Copper in an unsuccessful adaptation of Evelyn Waugh's Scoop (BBC, 1972); also in the comic vein, he was a slave trader Frankie Howerd falls foul of in an episode of Up Pompeii! (BBC, 1970). One of his most regularly screened appearances was in Steptoe and Son, "Cuckoo In the Nest" (BBC, 1970), as another, long-lost Steptoe son (or so he claims...), in one of the earliest episodes to exist in colour—many earlier episodes were actually made and originally screened in colour but, to the great frustration of Steptoephiles like myself, currently only exist in black and white. Damian Warren writes: "Just wanted to say well done for the biog done on my father, Kenneth J Warren. It's definitely the best I've seen, and as an actor myself it makes me very proud."